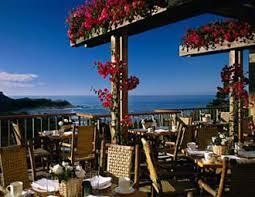 Most people head for Carmel when they long for a small beach city on California’s Monterey Peninsula. It is known for the museums and library of the historic Carmel Mission, and the fairy tale cottages and galleries of the village-like center. The Scenic Bluff Path runs from surf spot Carmel Beach to bird-rich Carmel River State Beach, with a scuba entry point. South lie the sea animals and whaling museum of Point Lobos State Natural Reserve. We go for the food. With dramatic views of the breathtaking Big Sur California coastline and Yankee Point, California Market Restaurant at Carmel’s Hyatt Highlands provides an ideal setting for a delightful breakfast or lunch with friends in a casual bistro atmosphere. Dine in the sun on the expansive redwood deck, or eat indoors next to a warm pot-bellied stove as you experience friendly and attentive service that Hyatt is known for around the world. California Market Restaurant at Hyatt Carmel Highlands offers something for every palate, with a rotating menu of freshest seafood, seasonal local produce, gourmet sandwiches and daily specials. Start your day with a delicious breakfast array, savor a light lunch or sip a glass of fine California wine as you soak in the magnificent view. Chad Minton is the super chef here. His Dungeness crabcakes with avocado relish, spicy remoulade, and Balsamic reduction dazzled us as did the fish tacos, a local catch, beer battered and served with Jack cheese, green chili aioli, and salsa. The seafood cioppino is a dark, spicy, intense brew of mussels, scallop, local catch served with crunchy grilled garlic bread. Service is snappy and friendly. California Market Restaurant at Carmel’s Hyatt Highlands, 120 Highlands Drive, Carmel, CA, (831) 622-5450, http://www.pacificsedge.com. Mundaka Restaurant in downtown Carmel-by-the-sea is a very lively and fun tapas bar that is packed inside and out with colorful locals enjoying aperitivos of all kinds, especially shellfish, plus paella, steaks and lamb. We started by nibbling on some toasty Marcona almonds and juicy Mediterranean olives. Then we opted for the sliced Serrano ham charcuteria drizzled in Alberquina olive oil. Frito in the form of garbanzo beans and white truffle salt called and we answered. We had to try the butter poached prawns in garlic and lemon and it was unsurpassed in its simplicity and excellence. We had room for the duck leg confit, bacon-leek purée, herb oil and we ended this feast with roasted pear, Valdeon blue cheese, hazelnuts in a quince vinaigrette. Spanish wine flowed happily. Chef Brandon sources foods that are strinctly free range, organic, biodynamic, line-caught, sustainable, naturally fed and refuses anything with antibiotics, growth hormones, gmo crops, corn syrup, artificial colors, artificial flavors, chemicals and preservatives. It shows in the purity of his cooking. This warm little spot is the result of great friendships, a love for Spain and its culture, and a lifelong passion for food and wine. Open in 2009, Mundaka continues to evolve daily with the contributions of chef Brandon Miller, local farmers and fishermen, and the musings of talented local artists and musicians who are regulars. 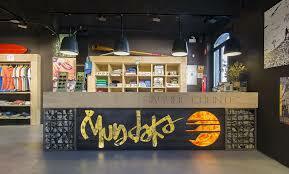 No trip to Carmel is complete without a visit to Mundaka. We can assure you it would be Hemingways’s favorite place were he still with us. 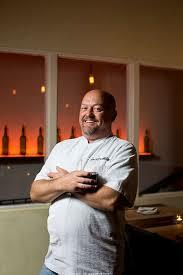 Mundaka Restaurant, San Carlos & 7th Ave., (831) 624-7400, dinner only, best to book ahead.